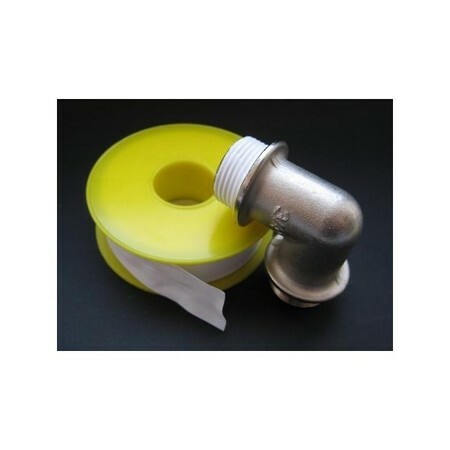 Tape FUM grade 1 - thread PTFE tape. Nepecino is a film made of PTFE - 4D, manufactured by rolling harness. Appearance Fuma — thin elastic band in white. Tape designed for sealing threaded joints of pipelines of all materials operating in the temperature range from -60 to +200°C and pressures up to 9.8 MPa. Allowed the use of the tape for the valve operating at a pressure of 41.2 MPa. For the coiling of ribbon you will need Fuma: Fuma tape and a small physical effort. mark 3 — for sealing systems with General type, as well as systems with strong, aggressive media (concentrated and dilute solutions of acids and alkalis); represents the marginal part of the tape FUM grades 1 and 2, as well as film SKL, made on the other 301-05-49-90. In addition to these 3 brands issued ordinary feed for retail to ordinary consumers. Before installing the valve with the seal tape FUM thoroughly clean from dirt and rust their thread, then rinse with gasoline. The winding of the tape on the valve threads or plugs engage from the beginning in the course of the thread so that subsequent round partially (30-40%) overlaps the end of the tape. In order to exclude the tape FUM the appearance of wrinkles and folds, which when screwing the plugs are bent and lead to decompression of the joints, wrap the tape tension. To facilitate winding the tape on the threads to wrap the tape from the roll, and the roll is pressed against the threaded parts and to move it in a circle. Once you have wrapped the ribbon, press it with force to the thread, scrolling with your fingers. Then start to screw the screw-coupling any item, such as a crane. It needs a tight twist and the ribbon Fuma warming up and fills all the space between the two threads. If you fasten the fittings screw easily, then pegmatite fly Fuma until then, until you start to accumulate heavily, so much so that even the key and then tighten it much, while tape Fuma needs to be squeezed a bit on a place of joining of valves and pipes. When you connect a ribbon Fuma all the necessary details, open water, look for leaks where. If you spot even a drop of water, then tighten some more this compound or pegmatite there is still a bit of tape. Tape Fuma is good because if you decide that any change in their water utilities, to understand all the details there is no work. Tape Fuma soft and elastic, not subject to destruction, does not corrode the joined parts. If you have collected all the flax or pale paint that disassembly becomes a problem when you need to warm up, burn out items, processing them in various solvents. Try to tape Fuma wound uniformly with a coil, if you just make a mistake, then it will begin to retract the pieces and not the whole ribbon.